The cruise runs between the all different islands scattered in the blue of the Aegean Sea. This itinerary has great attractions outside of the traditional tourist circuit. Ideal for sailing enthusiastic, for comfortable and fast sailing with wind abeam, for those who want to experience the thrill of discovering an island coming from the sea. The cruise can be weekly or 10-11 days to allow to visit a wider sailing area and to dedicate more time to the beauty of the area. Boarding in Paros and landing is in Kos. Welcome on board Penne Bianche! Boarding will be around 18.00 at Paroikià bay in Paros where your amazing sailing holiday starts. It’s suitable for everyone, families with children, singles and sailing enthusiastic. A welcome cocktail will be offered and you will get to know your crew that will show you the boat. Provisions will be already stored on board stored on board so you will be able to enjoy total relax. The luggage will be placed in the cabin before to go ashore for dinner. After a rich breakfast we sail toward the channel between Paros and Antiparos for a swim in the crystal clear waters of the small Pantieronis Islands. In the afternoon we reach Schinousa (20 miles). Our first anchorage to get in tune with the peace and tranquility of the Greek islands that we’ll be visiting with our sailing cruise. Visit ashore to the small Chora. For dinner a gourmet cuisine on board prepared by your skipper. 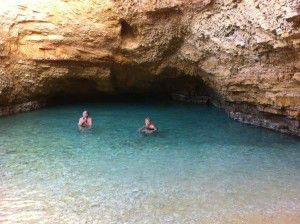 a swim before breakfast and sail to Amorgos (20 miles). 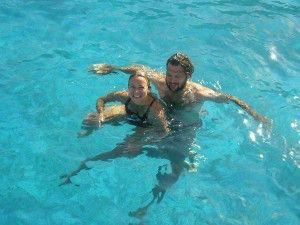 We stop for a swim anchoring at the small little islands of Antikeros, crystal clear water in a wild setting. Short sail to reach the mooring at Katapola. 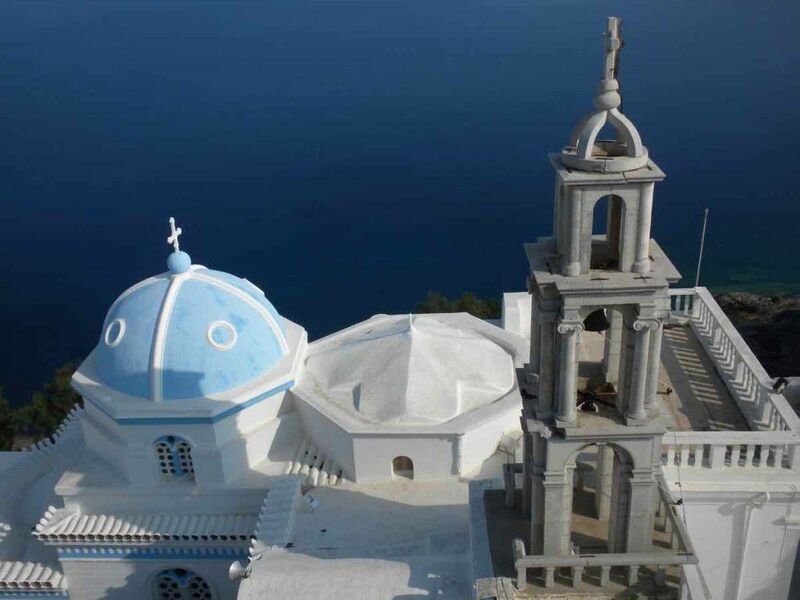 No-one should miss a tour of the island, especially to visit the famous monastery of the Panaghia Chozoviotissa, completely built into the living rock, and the Chora, that rises all around a Venetian castle, with lime painted houses, little churches and a museum. The hospitable monks welcome you to show you the monastery and offer a typical liqueur. We’ll sail at dawn towards Astypalaia (40 miles). Penne Bianche, a Grand Solile 46, is admired on the docks for her beautiful lines and fine details that differentiate her from the usual charter boats. It’s the western island of the Dodecanese but it’s closest to the Cyclades. We’ll see the white Chora shining on the dark rocky hill, with little green oasis and beautiful sandy bays. Right in the middle of the island the ground becomes thin, giving the island the shape of a butterfly. 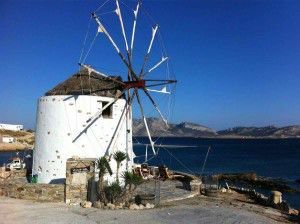 The Chora, in the south-western part of the island, is very picturesqueit’s situated on the side of a hill, as an amphitheatre, right under the majestic castle and a row of windmills. 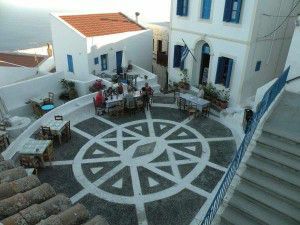 The typical architecture, although it’s similar to the kind that can be seen in the Cyclades, has some characteristic elements that make it look brighterthe wooden balconies and the stairs are painted in vivid colours, the gardens and terraces often full of flowers. Mooring in a bay, we’ll have the chance to visit the island. 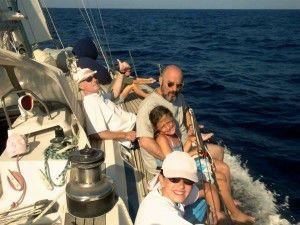 A great sailing holiday where Mediterranean cuisine is one of the most intriguing aspects of this trip. Shore excursions, visiting the island, sail to the islet of Kounoupi and return to anchor the quiet bay of Maltezana in the middle. The sailing charter crew offers attentive service to its pampered guests so they can enjoy the sailing holiday with no thoughts. After sailing quite a long way East (35 miles) we’ll arrive in the little port of Paloi, to visit the volcanic island of Nisyros and the volcano itself, by motor-cycle. Truly impressive is the wild beauty of the green landscape and its vivid coloursfew beaches, black rocks, white houses with bright colours painted doors and windows. The road goes up and then down inside the volcano, through many olive trees. The main crater is 260 meters long and 30 meters deep. The bottom can be reached by following one of the paths on the sidethe ground is hot and emits steam. On the sides of the crater we can see the yellow traces of the sulphur and the whole area looks like a lunar landscape. 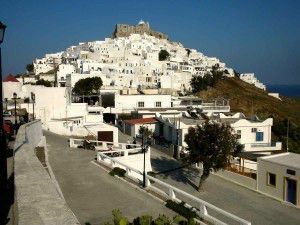 Mandraki is the main town of the island, built under the impressive massive rock where the monastery of Panagia Spiliani rises and behind the black rocks just in front of the seaside. Huge citrus trees bring some shade on the picturesque lanes and the wonderful squares. Here, the traditional habits are still respectfully observed. The monastery and the medieval castle, from where the view is breathtaking, deserve to be visited, as the Acropolis and its fortification walls, dated back to the IV century B. C.
Last miles and we reach Kos (20 miles). We anchor for a swim and for lunch we have pizza!! In the afternoon we moor at the old port and town visit. Dinner ashore. In the morning the Cyclades and Dodecanese sailing cruise ends. Landing at 08.00. The lenght of this sailing cruise is suggested to be of 10-11 days, an amazing itinerary.. not to be missed!